The idea of books as art is hardly new. The concept of the artist’s book is a familiar one; indeed, there are artists’ book fairs all over the place. It’s just that when books become art is usually in the form of a book work: a book by an artist that functions as a work in its own right rather than as documentation. 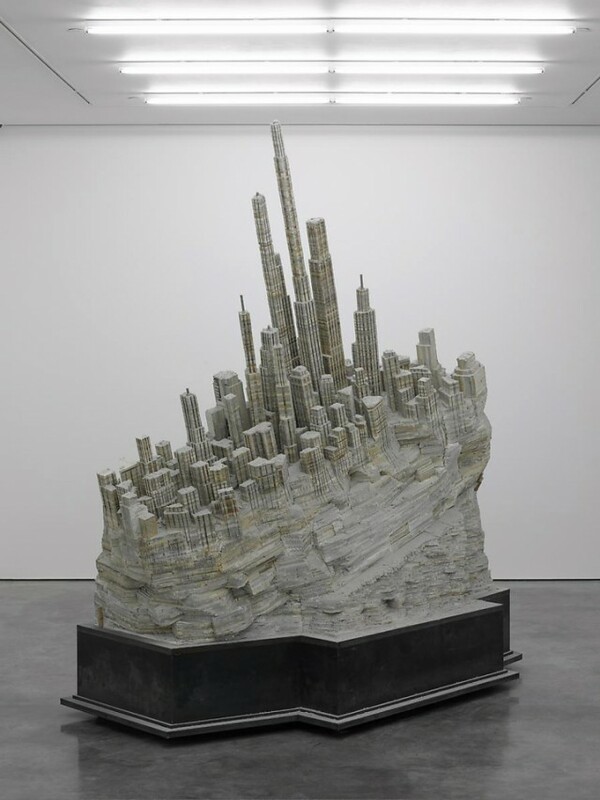 In Liu Wei’s exhibition at White Cube, Bermondsey at the moment, books have become sculpture and taken on the form of a city seemingly teetering on a rock with skyscrapers leaning at alarming angles. The buildings are grey and dusty; their forms are slightly abstracted. Though they reach for the sky there is a feeling that all is not well here. This is a city of the future as a dystopian space. There is a lack of space here with buildings packed tightly together and there is no evidence that this is a populated space. Have things gone catastrophically wrong somehow? Though the space within the work seems uninviting, the work itself is fascinating. The books are held tightly together and have been cut into to form the buildings. The way the city seems to teeter on the edge is alarming but visually it’s dynamic. Though ultimately the work needs to be looked at as a whole, I also find myself drawn in to examine the way the books have been cut and absorb the detail up close. In another space – 9 x 9 x 9, the white cube space at the heart of White Cube, Bermondsey – another sculpture suggests a built structure. Merely A Mistake II No.1 feels rather like some sort of altar or cathedral. This is a larger sculpture and one that demands to be looked at from a greater distance. Again the materials employed had a life before the work. In this case the sculpture is an assemblage of doors, door frames and panels, the detail of the frames creating an unexpectedly decorative work. I’d gone to White Cube, Bermondsey to see whether Gilbert and George’s London Pictures gained anything when one saw more of them – they really don’t – I’m so glad Liu Wei’s work was there as compensation. 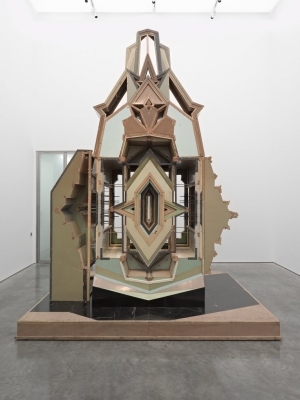 Liu Wei is in the North Gallery and 9 x 9 x 9 of White Cube Bermondsey as part of the Inside the White Cube programme until 12 May 2012. 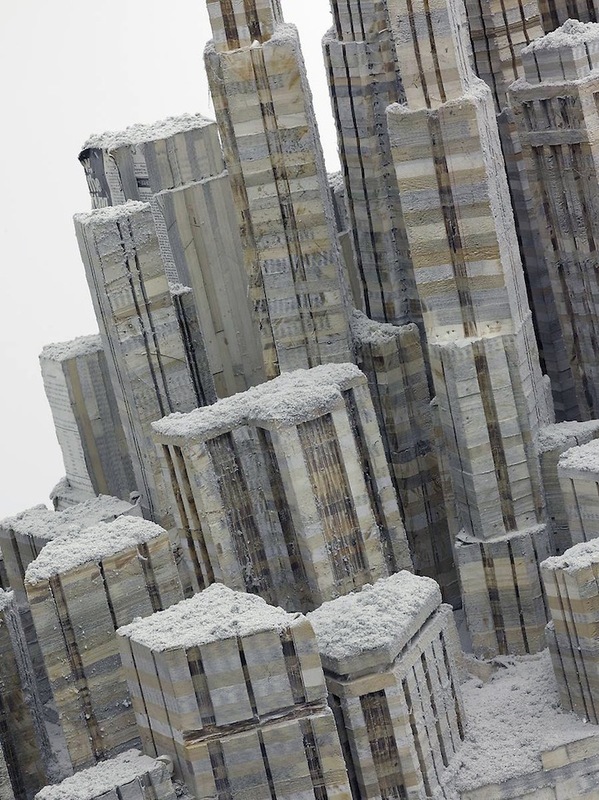 This entry was posted in Sculpture and tagged art, books, Liu Wei, Merely A Mistake, Merely A Mistake II No.1, sculpture, White Cube by Ann Jones. Bookmark the permalink.